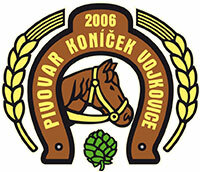 The Koniček (Little Horse) Brewery was founded in 2006. The name is derived from the name of the previous owner of what used to be the farm where the beer is brewed today. The delicious taste and the high and unchanging quality will make all true beer drinkers literally whinny with delight. For the entire brewery and brewing community, their work has become their “hobby”. This has resulted in this traditionally conservative beer region having found this brew to take an irreplaceable role in the taste buds of many fine beer lovers. The permanent selection includes unfiltered and unpasteurized beer mostly with horse names (in Czech, of course). Ryzák, Vraník, and Grošák happily trot along with filtered Poník and Vojkovjan. The brewery brews up about twenty specials during the year. The popular ones include Hatatitla (India Pale Ale – IPA) and thrice (cold) hopped Podkovář. Also successful are Čmelák and Sršeň, with honey from local beekeepers. One of the strongest beers in Moravia is the Štědrok (24%), served at Christmastime. The novelty of 2017 is Valach-tyn (14%) – a pink Valentine special not only for lovers. In addition to the Pub U Koníčka (which seats nearly 100 guests and has its own accommodations), beer is currently tapped at more than 80 locations in the Czech Republic, Poland, and the Slovak Republic. With its annual production of more than 10,000 hl, the brewery is no longer a classic microbrewery. The beer is available in kegs, PET bottles, and glass bottles. The brewery leases its own refrigeration facilities. The brewery complex includes the Koníčkův dvůr courtyard 1 km from the existing brewery, with its own loading ramp, grocery store, butcher, pub, and pastry shop. Tours of the brewery are by appointment. For enlightenment and a few laughs, we publish the occasional beer periodical Koniny. Every year in June, a beer festival is held – Koníčkův den (Koniček Day), then in September there’s a unique sports and beer competition Točko Kapp.